Oatmeal Carmelitas are a delicious cookie bar with an oatmeal- shortbread bottom, sandwiched between a ooey - gooey chocolaty, caramel middle. 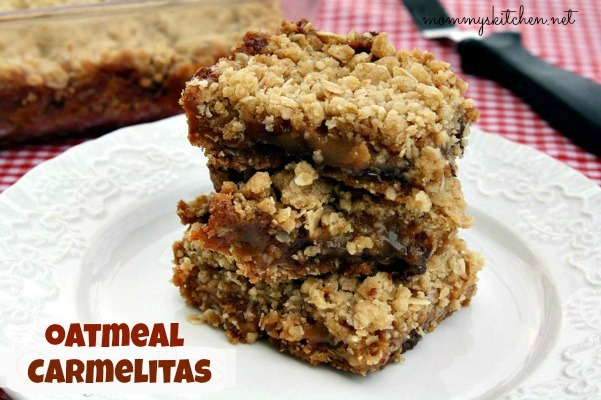 Have you ever had an Oatmeal Carmelita? I had my first one a couple months back. What are they you ask? They're pure heaven in my opinion. Carmelita's are cookie bars filled with gooey caramel and chocolate baked together inside a buttery, oatmeal, shortbread crust. I love the simplicity of cookie bars and Carmelita's are at the top of my favorite cookie list. My all time favorite cookie bar is Knock ya Naked Brownies, but these come in a close second. I found this recipe a couple months back on Pinterest and knew I had to try them. These cookie bars have a crunchy oatmeal crust on the top as well as on the bottom. The chocolate and caramel center is a match made in heaven. I actually have several more cookie bars to try that I've pinned, so if you're on Pinterest follow my cookie board. Until then you must make these delicious bars. Next time I might try adding a combination of chocolate and butterscotch chips, because those are my favorite. Combine caramels and cream in a small saucepan over low heat. Stir until completely smooth; set aside. In a separate bowl, combine melted butter, vanilla, brown sugar, flour, oats, and baking soda. Pat half of the oatmeal mixture into the bottom of an 8 x 8 inch square pan. Bake at 350 degrees for 10 minutes. Remove pan from oven and sprinkle chocolate chips over crust. Pour caramel mixture over chocolate chips. Crumble remaining oatmeal mixture over caramel. Return to oven and bake an additional 15-20 minutes, until the edges are lightly browned. Remove from oven and cool completely before cutting. You can also place them in the fridge for just a bit to cool off if you're pinched for time. They shouldn't be served cold, but all of that molten caramel takes time to cool down. Store at room temperature. Cook's Note: The recipe states evaporated milk or heavy cream. I have made these cookie bars using both with no difference in the recipe, so use your preference. These look amazing! I'd like to make them today as I have the ingredients with one exception - I only have quick oats. Do you know how that will affect the recipe? Thanks! I have never used the quick oats to make the Carmelitas. I did do a bit of poking around on the internet and it looks like Pillsbury uses quick oat's in their recipe. Oh man!! I LOVE these cookie bars. My recipe is similar...I use ice cream topping instead of caramels. Yours look fabulous! Pinning! I have been making these for 30 years or more, and love them. But instead of caramels and milk I use caramel ice cream topping with 1 tablespoon of flour added. and on the quick oats question, i have used them often (I usually forget to buy the other ones) and they come out fine. Ooey gooey goodness is right!!! !